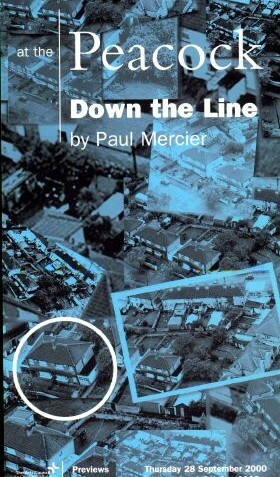 Beautifully written domestic drama from Paul Mercier, whose mission to show &#147;that high drama exists in lower life, that the extraordinary is to be found among the ordinary&#148; continues. The story concerns the fate of a lower middle class Dublin family poised on the brink of seeing its members going their separate ways. As the play opens, there is tension between mother and father, the eldest son has already emigrated to England, the eldest daughter, who never completes any task fully, has brought home the latest in a string of boyfriends, the younger son is struggling to get his punk band off the ground and insists on trying to claim social welfare payments despite his father&#146;s embarrassment, and the youngest daughter has begun to embrace student politics. As the drama proceeds, we are taken further &#145;down the line&#146; of the family in the hope that at least one of them will be saved from bourgeois hypocrisy and self-absorption. Mercier&#146;s first work commissioned by the National Theatre is more measured in its expression of political concerns than usual, but despite exploring a pleasing netherworld between commitment and delusion, ultimately aligns itself firmly with the dogmatic younger daughter. Her belief that people have a duty to look outside of themselves and try to make a real difference to the world though social defiance is shown to suffer various ridicules and challenges. Though she is ultimately less successful as a class rebel than she hoped, she commands sympathy in her struggle. The bulk of the play is taken up with a careful and very well crafted series of character interactions which are smoothly controlled by director Lynne Parker. It is deceptively simple in structure and presentation. The set consists of a cross-section of the family home which features four exits and three active spaces: a kitchen, a hallway, and a garage. Character entrances and exits are naturalistic but swift, and good use is made of the defining nature of such spaces in a typical family home. Unseen is the house garden which has been ravaged by storm at the beginning but which the long-suffering father attempts to nurse back to health as the family seems to be going in the opposite direction. The garden space is occupied by the audience in what amounts to a not particularly subtle assertion that this play is more than just a casual entertainment. Set in the 1980s, Down the Line draws upon a very particular economic and social context. Its references to abortion, punk, emigration, and even, eventually, the fall of the Berlin Wall and the growth of the computer business all serve to reinforce Mercier&#146;s deeper concerns, and it does work itself out as a discourse upon the difficulties in Irish society and social attitudes. The strength of this production is not its metaphorical richness though, nor its rumblings about class and conflicting belief systems. It is at its best on the most basic level, as a depiction of family dynamics.Mercier&#146;s command of character and dialogue makes the play superbly authentic. Despite one or two loaded monologues, most of what transpires on stage is most convincing on a human level. The performances are equally important in this regard, of course, and each of the cast makes an important and relatively equal contribution. In the central role of the younger daughter, Karen Staples does well balancing the left-wing rhetoric with genuine human emotion. Barbara Brennan and Clive Geraghty are all-too recognizable parents coping not only with the changes their children&#146;s ongoing lives bring to theirs, but with their own long and clearly difficult relationship. Both actors are compelling in the roles. Most commanding among the other children is Brian Doherty as the self-assured emigre who seems doomed to repeat the &#145;mistakes&#146; of his elders and doesn&#146;t seem to mind. Parker uses his physical presence well and the actor enjoys one or two of the play&#146;s more tender scenes alongside Staples. Supporting performances from Keith McErlean and Eunice McMenamin are also good, though Neili Conroy gets a slightly silly (if polemically effective) role as a wide-eyed Hindu-wannabe. Down the Line is solid, well-crafted, naturalistic theatre which is usually involving and sometimes funny. Mercier has claimed that alternative theatre has been &#147;the life force, touchstone, spring well, inspiration, and conscience of Irish theatre for over 30 years.&#148; Though this play is most definitely mainstream and has all the gloss and style of a high-end production, it is still a work of conscience. Its account of the demise of old fashioned ideas of family is not quite as triumphalist as might have been expected, nor its account of the blossoming of an alternative consciousness quite so unreserved, but Mercier still has something to say and is able to say it while delivering nicely on a mechanical level. The play is worth seeing, although fans of his angrier and/or funnier work may be disappointed.